After a couple of months moored at Lincoln waiting for something to happen and with a couple of visits away under my belt its now time to move on. 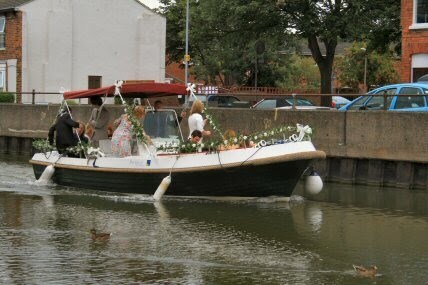 The day I left the mooring for Saxilby and some derv a wedding party went past. Derv picked up then its back to Lincoln and a visit from Sid and Heidi to arrange a visit to Horncastle. Visit arranged so down to the moorings at Bardney where I write this. hope these comments mean more to you than they do to me! Ah, you spotted the Burton Waters wedding.